Built for heavy-duty chuck work and shaft machining of a variety of lot sizes, the LH-55 Series combines solid construction and the powerful THINC-OSP control to provide reliable accuracy. Opposing V8 + V8 turrets are equipped with permanently set tools available from a free-choice system of turrets. 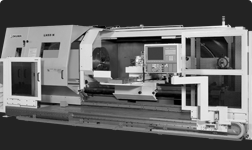 Dynamic and precise horizontal lathe with V8 + V8 opposing turrets.